How challenger banks are stepping up their lending to small businesses to boost their market share. These days it’s hard to miss Monzo’s bright orange debit cards at ATMs and shops. It’s also hard to miss the growing impact of challenger banks as they become more and more active in financing growth businesses. Since 2008, more than 50 new banks have been granted licences in the UK. And many of those banks have carved out a niche for themselves as lenders in the SME space. However, they still face difficulties that are holding them back from reaching their full potential as small business lenders. What do challenger banks offer? Most of the challenger banks lend to SMEs, with a few of them lending exclusively to small firms. Typically challenger banks support SMEs with products such as loans and overdrafts, but some of them also offer things like invoice and asset financing. But the term ‘challenger bank’ is quite broad – in fact, KPMG thinks it’s outdated because it refers to many different banks focussed on many different niches. The British Business Bank pulled together a list of the different banks in 2018 which is a good starting point (see below). It includes more established names like Metro, Shawbrook and Aldermore; as well as newer entrants like OakNorth, Starling and Monzo. Borrowers use bank loans for a range of reasons. Boutique property development firm NestEast, for example, recently signed a £4.7m development finance facility with Shawbrook Bank to finance the development of nine new apartments in East London. The firm’s director praised the bank for being a “flexible, creative lender”. Source: British Business Bank. Builds on analysis conducted by PwC presented in ‘Who are you calling a ‘challenger’? How competition is improving customer choice and driving innovation in the banking market. Challenger banks say they are struggling due to an uncompetitive marketplace. To start, they are competing against big rivals, whose market share dwarfs their own. Another of their main complaints is regulation. For years they have grappled with capital requirements rules which require them to apply a standardised approach towards calculating risk-weighted assets, while their larger rivals are able to apply their own methods. One study found that risk-weighted assets accounted for 45.1% of the total for challengers, but just 27.1% for the incumbents. Having more risk-weighted assets means a bank must hold more capital against its loans to prevent insolvency, which restricts its return on equity. “I think there is a massive disadvantage,” Rishi Khosla, CEO of OakNorth, told MPs last year. The situation may improve soon, however, after the Prudential Regulation Authority (PRA) tweaked its capital regime in 2017 to try and level the playing field. Because capital requirement rules stem from EU law, some also hope that Brexit represents a chance to loosen these requirements further. Despite these hurdles, challenger banks are well-placed to act as lenders for small businesses. The main strength that challenger banks have is their agility. Being smaller and more focused allows them to do business where others can’t, and respond flexibly to the needs of small businesses. They are also receiving support from a couple of places. One is the British Business Bank, which has invested in fundraisings by Shawbrook and by Atom Bank. 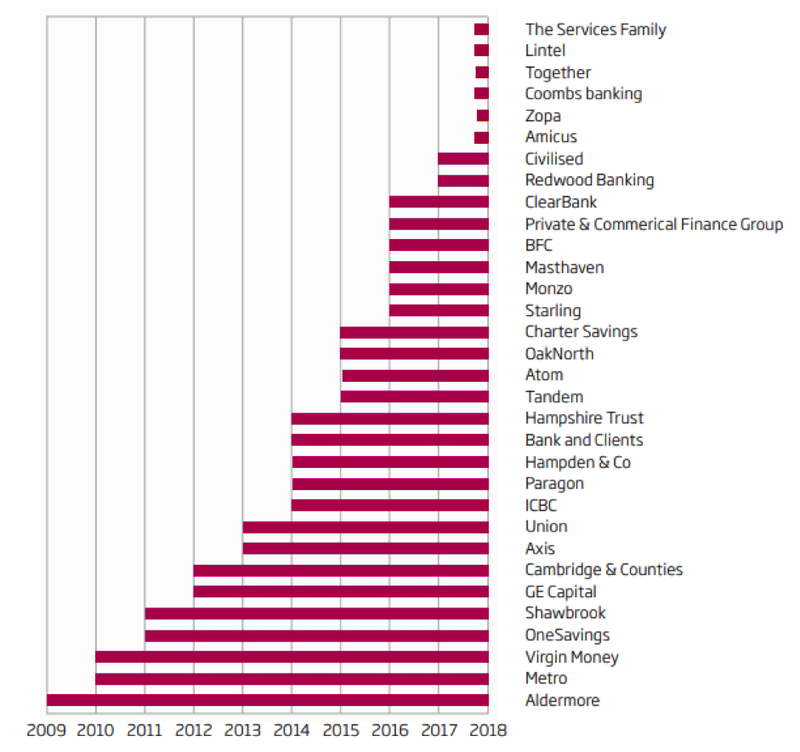 Another is the Alternative Remedies Package – a scheme that channels funds into smaller banks in order to offset the state aid that RBS received from the government in 2009. Metro Bank, Starling Bank and Clear Bank won the first tranche of this cash, totalling £280 million, earlier this year. This year at the inaugural Growth Finance Awards we will be celebrating the UK’s Best Challenger Bank. We’re keen to highlight how important they are for growing businesses. We do hope you join us there. You can enter the awards in this category or any of the others here.